Andrew Grounsell passed away on 20th October 2016 at the age of just 54 years. Last week in a previous post I wrote about Andrew - the dad, husband, son and friend. However, as well as being hugely successful in his personal life, he was also an incredibly talented architect. Some of the most accomplished projects in the Space Architects portfolio have been designed by Andrew. At Andrew’s funeral, there were several moving eulogies. David Coundon, one of Andrew’s colleagues at Space Architects shared his memories of Andrew the Architect. I have used the basis of this to share more about Andrew’s career. Andrew qualified as an architect from Newcastle University in 1988. He spent his first year out at Browne Smith Baker in Newcastle and then moved to London to join Damond Lock Grabowski & Co for his second year out, before joining Crampin & Pring who had recently set up a base in Vauxhall, London from their Nottingham head office. This was the peak of the 1980’s building boom. Andrew fully immersed himself into the culture of the Capital and Vauxhall itself. During this time, he was involved in retail architecture, delivering a shopping mall in Leeds. Then the country was hit by the recession and Andrew spent the next two years remodelling his flat before heading home to the North East where he joined FaulknerBrowns in North Tyneside. 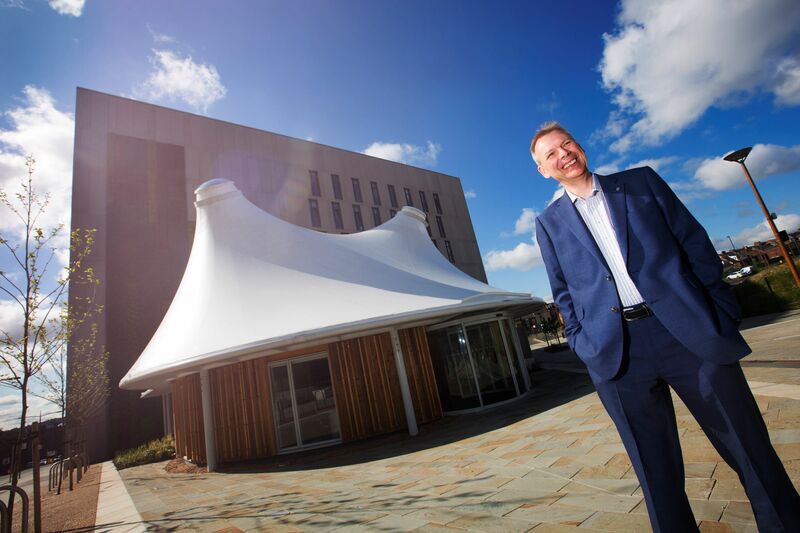 Here, Andrew put in all the dedication and hard work to learn the skills he needed to become a fully well-rounded professional, with one of his early successes being the design of the Teesside Innovation Centre. At FaulknerBrowns he also designed and delivered Bishopbriggs Leisure Centre, fantastic student accommodation in Sheffield and magnificent work for Queens University. He also worked extensively with Greens Health Clubs when they rolled out nationally. Andrew joined Space Architects in 2006. By this time his extensive experience allowed him to produce an outstanding body of work and ultimately, some of the buildings of which he felt most proud. From thoughtful and innovative school projects across the north of England such as Cramlington Learning Village, St Roberts and Oakfields - to large and complex higher education schemes such as the Durham Gateway, which along with the Pandon Building and extensive landscaping also involved the Bill Bryson Library. There are also some unique gems and small masterpieces such as the Key, Graham Sports Centre and 19 Close House. His now encyclopaedic knowledge also saw him recognised as an international sports consultant, working in Istanbul on the Ashgabat Olympic Complex. Andrew the Architect was dedicated, thorough, determined, decisive (even stubborn!). He was also friendly, funny and patient. If you were to ask his colleagues and clients about his key characteristic, it would be that Andrew always made time for people, no matter how pressured the environment. He had a laid-back nature and was happy to spend hours mentoring younger colleagues or painstakingly explaining complex technical issues to a client for the thousandth time. Our profession has lost someone special but his legacy will remain as we all can enjoy his buildings for many years to come.